I am not a crafty person. I nearly flunked out of the adult ed sewing class I took when I was nineteen, am just passable at other needlework, and was a dismal failure at scrapbooking four years ago. 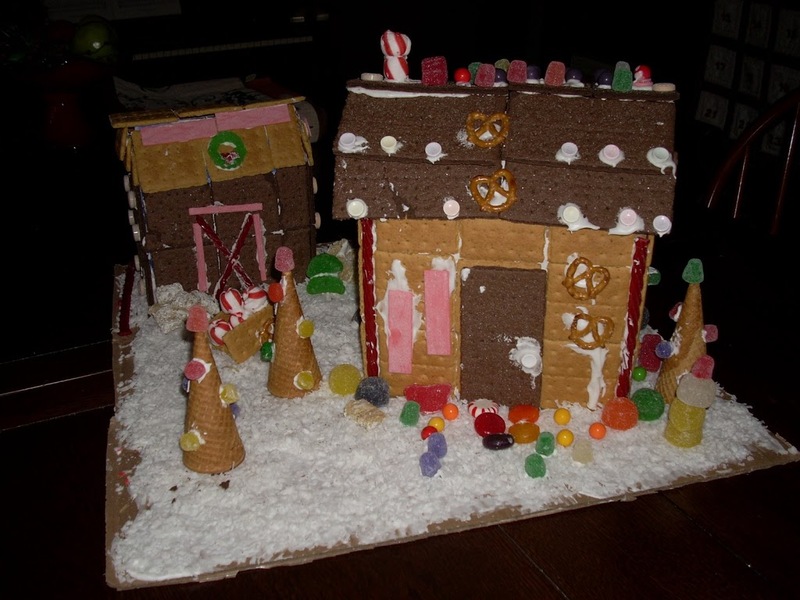 Every Christmas the kids and I do our version of gingerbread houses. I tried actual gingerbread one year, but it was a nightmare. Using graham crackers stuck to boxes with gluey icing works much better. In past years I’ve been a bit obsessive about these houses, worrying over the placement of every gum drop as though they were going to be graded. But no more. This year I pretty much just left my kids alone and didn’t much worry about my own small contributions. We had a great time! Bengal did a version of the farm scene we did last year, complete with sugar cone trees–there was one more tree, but Hrothgar snarfed one before I caught him at the table. Preheat oven to 325. Grease a tube or Bundt pan, plus a loaf pan. Cream butter and sugar in mixer. Add eggs and lemon extract. In separate bowl, stir together flour and baking powder. Chop nuts and pineapple. Mix fruits and nuts together. Add flour mixture to butter mixture a cupful at a time. Add fruit and nut mixture. Mix well. Bake pans on center rack in oven. Put a pan of water on a lower rack as well. Test loaf pan doneness with a toothpick or cake tester after 1 hour. Baking time for both will be around 1 and 1/2 hours for both pans. I hope your holidays are full of blessings and that the New Year brings you and the ones you love peace, prosperity, fulfillment, and contentment. Thank you so much for sharing your time with me. Books…out of stock…*sigh* teaches me to foray out in the chill season. A pound of butter, a half dozen eggs and then a sweet cake, how in the world could one go wrong with that? And then we get to the heart of the matter…In this season wishes count as prayers and with your prayers my hope is they all get answered. May that portion within that asks such things be multiplied a hundred fold. Merry Christmas to you and your family! One of the best gifts of 2008 was meeting you! I’m going to see if I can get someone to make the fruitcake for me. Looks good! Hope you found something fun for your niece, Mark, and had a wonderful Christmas. I loved your post about the day! First of all, Merry Christmas! 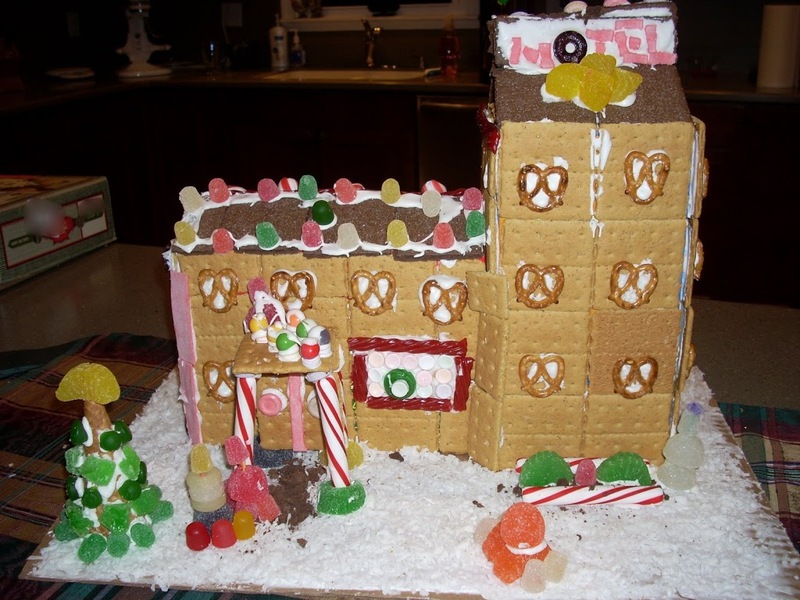 And I absolutely loved the gingerbread hotel. Merry Christmas to you, too, Lilithas. (There are eight days left!) I thought Pom did a great job on the hotel, too. We’ll start eating off of it tomorrow! Thank you so much, laughingwolf. I would offer you a lovely serving of fresh pecans instead of fruitcake–I can’t believe there’s a whole pound of them in the recipe. Fortunately, fruitcake is a once-a-year indulgence!